Entertaining during the summer should be all about ease, simplicity, and should include things that can be done ahead of time for your soirée—even for hosting a party on the Fourth of July! For any holiday-themed event food is a fun (and easy!) way to bring it to life. But, keeping it simple and stress-free is important. These six do-ahead ideas can be done with simple items found easily at the grocery store, craft store, and even items already in your own pantry that will bring the party to life! Kick off your own fireworks with these six do-ahead 4th of July ideas for a summer soirée in red-white-and-blue style! Red, white, and blue ribbons tied with a simple knot onto the stems of glassware is an effortless transformation with a dramatic effect! Make sure the tails are extra-long! As your guests hold their glasses the ribbon cascades for a stunning look, especially when multiplied across the backdrop of the party. Matching-patterned cocktail napkins will pull this look together. Use this simple idea to accentuate those savvy cheers-worthy moments! Once you have decided on your menu, choosing the right serving dish is a helpful and time-saving next step. Write on a sticky note with each of your menu items and label each serving piece with the corresponding sticky note. 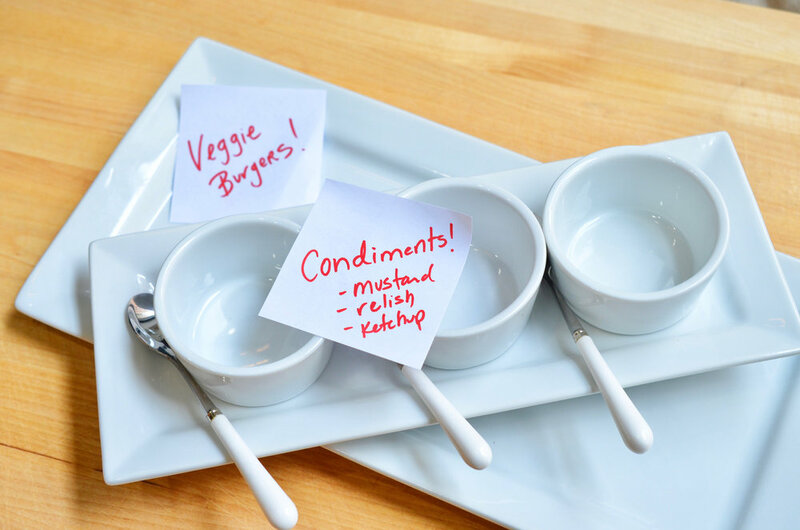 This is also helpful during prep the day of the party when a guest asks, “Where should I put the veggie burgers?” All they have to do is look for the labeled platter! Your food table is planned, organized, and ready to go. Having platters and other serving pieces for every holiday can be an expensive investment, not to mention a storage overload. Instead, use acrylic rock crystals (they are typically used as filler in vases or scattered around a table) to punch-up an everyday white platter! Choose a combination of colors (two or three—four or more is a bit overwhelming) that captures the colors of your theme. Then, simply use a hot glue gun to affix the faux gems to the rim of a heat-proof platter. You can do them in a pattern, a cluster, or arranged as section dividers on the platter. After the party is over, the acrylic rocks just pop off leaving behind your simple white platter ready for the next holiday! Hurricanes had height, light, and a bit of drama to any décor. Use the same acrylic rock crystals as the color-pop platter idea to create hurricanes on theme with your holiday look! Place your candles in the hurricanes. Mix together the three rock crystal colors, in this case red, silver, and blue. Pour the rock crystals around the candles in each hurricane, about half way up the height of the candle. Doing as much ahead of time is key to keeping your soirée simple and stress-free. After all, you want to enjoy the party, too! A delicious and easy-to-make summer pasta salad is the answer. Pasta salads taste better when you make them in advance and allow the flavors time to meld together. Since you are already in the kitchen making a fabulous summer pasta salad (like my Pesto & Arugula Pasta Salad! ), why not do one more small step to package it up in individual servings using take-out containers, also dressed with ribbon tails. This is the easiest way to pack food for large groups without having to worry about serving bowls and utensils, spoons, and forks—just include a set of to-go chopsticks for each guest! Best of all, the container, ribbon, and chopsticks are all recyclable, making clean-up easiest of all! Do you have a drawer filled with mix-and-match napkin rings? Where do their counterparts go? It’s like the tabletop equivalent of socks “eaten” by the dryer! Ribbon is the go-to solution when you need to add a bit of flair to a tablesetting, BBQ, or picnic. Wired-edge ribbon is a perfect substitute for dedicated holiday napkin rings. Instead of owning a set of twelve red- white-and-blue glittered star napkins rings to use once (maybe twice) a year, buy a spool of glittery star ribbon as a perfect alternative! I love the last few days leading up to Christmas, there is a frenetic buzz in the air, everything seems to smell like peppermint and cloves, and the decorations on the streets and in the windows are like no other time of year! I was asked by WGN Chicago for my top tips on some last-minute holiday ideas and I think I came up with a few you are going to absolutely love - and best of all you can find everything at your local grocery store! Below is the clip for you to watch and hopefully get inspired to some festive cheer to your home this time of year! Here are the recipes for my Cointreau Chocolate Ganache and Cointreau Winter Cider. Sending love, hugs, and well wishes from my home to yours - Happy Holidays! Each year as Halloween approaches I get excited for the start of the Autumnal season of holidays and traditions. The weather starts to cool off, spiced apple drinks start to flow (I like mine spiked! ), and Halloween inaugurates the holiday celebrations with fun and creativity. There are many directions to go when decorating for Halloween. From kitsch to all-out ghoulish crypt-keeping, often I am left with piles of decorations in November that immediately need to be stored to make way for Thanksgiving. This year I decided to take a different approach. Less pumpkin tchotchke and no conversion to a full cemetery in my living room. Instead, Halloween this year will be paired down to be sophisticated, chic, and best of all done in minutes! My inspiration for a sophisticated Halloween theme is to utilize a monochromatic color palate of sumptuous black tones, and then to create focused vignettes in specific areas around the apartment. This keeps the decoration contained and easier to manage and is visually more dramatic. 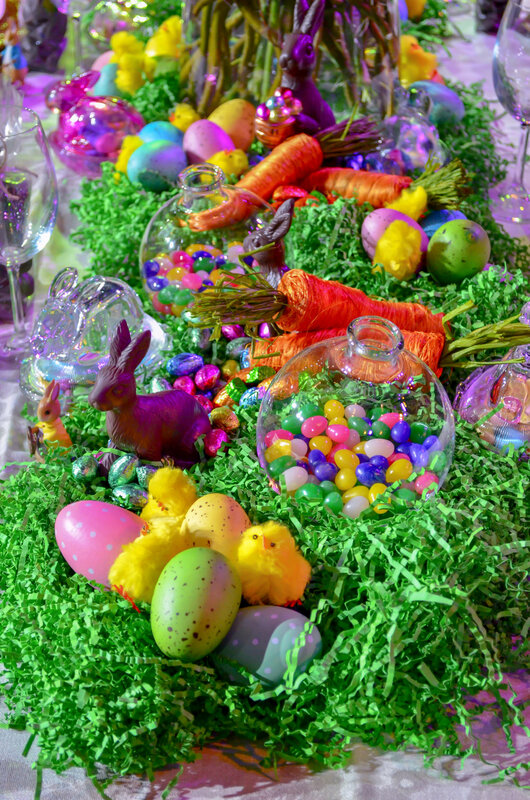 I also approached my theme with classic easy-to-find decorations in the seasonal aisle in my grocery store and drug store, but layered them in a more curated way. As beautiful as many of the high-end Halloween decorations can be, they have to be stored year after year, and may not fit your style or space the next Halloween. All of my decorations fit in a plastic boot-sized storage container for all holidays (except Christmas, of course). The simplicity of a monochromatic palate is enhanced with different textures in the same black tones, which adds depth, interest, and a more layered look. Use this visual All-Hallows-Eve photo series as inspiration for your own SPOOKtacular décor! Pick and choose the elements that resonate with you, play some Halloween-inspired tunes (Pandora: Halloween Party Radio is my choice! ), and just have fun adding some BOOtiful elements to make your space come alive – if you dare! Cobwebs, Spiders, and Crows - OH MY! Everyday Items Get a SPOOKtacular Makeover! A Centerpiece Worthy of Frightful Screams! Classic Halloween Icons Perfect for Place Cards or Food Markers! Thanksgiving for me has always been a favorite holiday as it mostly takes place around a table filled with family and friends, sharing stories and while making more great memories! While the food is always special, and bit more decedent (more butter!) 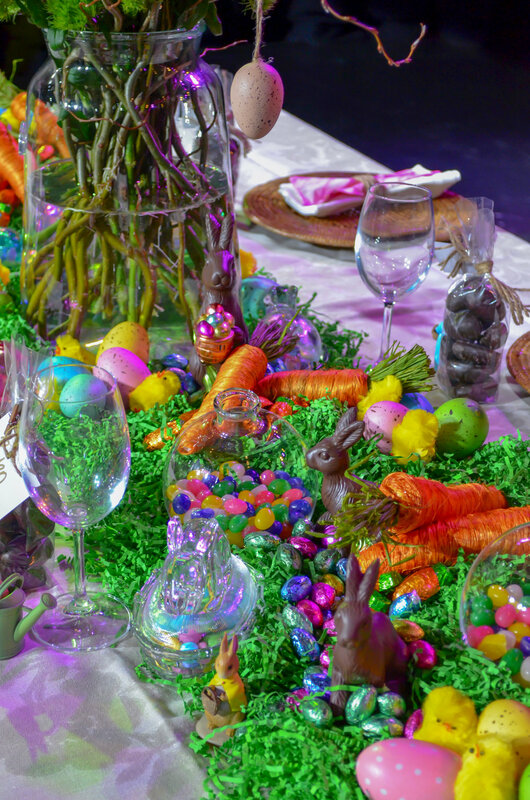 on the day, one of my favorite parts is setting a festive table. A great Thanksgiving table doesn’t have to be as complicated to create as the Thanksgiving meal itself, or take as much time. A beautiful table is the perfect complement to a hearty and flavorful meal, creating a warm and inviting environment. I love mixing textures, patterns, and autumnal colors to help bring together a rustic and elegant tablescape. A layered table filled with different textures instantly creates a visually interesting and cultivated table—and truth be told is even better when everything isn’t so “matchy-matchy”. I love mixing different metals like copper mirror-finish stemless glasses (for water), hammered gold flatware, pressed glass amber chargers and salad plates, casual stoneware dinner plates, and a rustic low centerpiece of dried twigs (from the grocery store! ), pinecones, and fresh orange tulips (in floral water tubes)! All of these elements add interest and complexity and help create a table filled with textures that work together—even though they are all different. I love using traditional damask tablecloths as a backdrop to most of my tablescapes. This sets the backdrop elegantly, setting the stage for even the most modern table. Mixing in damask napkins in complimentary tones keeps everything fresh and new (again, not so matchy-matchy, but complimentary). Patterns are also found in the design of the plates, silverware, and even the ridges in the goblets. All of which provide visual diversity. Classic autumnal colors like orange, wheat, amber, and other warm tones are all brought together with the help and balance of a neutral dove grey, copper, and bright green (from the tulips). I love using bold tones against neutral tones—it warms the neutral colors and helps the bold colors really pop! While this is a quick course in creating a fabulous Thanksgiving table, these are not “rules” so much as guidelines that apply also to everyday living and holiday entertaining. If you are feeling curious, here is a link to all things Thanksgiving! From my table to yours, happy Thanksgiving! Some furnishings provided by Mikasa. If you have never made homemade ice cream, you are in for a real treat! A few months ago, I was making my Velvety Hot Chocolate from my first cookbook Entertaining with Love, and while I was measuring out the ingredients it occurred to me that they were very similar to the base ingredients for my ice cream recipe. After a bit of tweaking (and lots of taste testing! ), my Salted Hot Chocolate Ice Cream was churning away in my ice cream maker, ready for its close-up! This is by far the best and most luxurious chocolaty ice cream I have ever had, let alone made myself! The texture is similar to a velvety mousse—light, airy, and incredibly silky. The flavors are so rich and intense, from using really good ingredients (particularly the chocolate and cocoa powder), and my secret ingredient: Fleur de Sel caramel sauce. Rather than make your own caramel sauce for a few tablespoons, I like to use a good store-bought one. In fact, my favorite jar is from Trader Joe’s (also where I buy my chocolate bars by the pound). For the ultimate ice cream enjoyment, allow each scoop to sit at room temperature for a few minutes and you will be able to taste the flavors much better than it being ice-cold. The most perfect chocolate ice cream is calling your name – enjoy! In a medium sauce pan set over medium heat, add the heavy cream, brown sugar, caramel sauce, and both chocolates. Whisk until the chocolate is just melted. Remove from the heat and whisk in the vanilla, cinnamon, salt, and cocoa powder. Transfer to a bowl and cover with plastic wrap pressing it directly onto the surface of the mixture. Chill the mixture in the refrigerator until it is very cold. Once the mixture is chilled, add it to an ice cream maker and follow manufactures directions. Scoop out the ice cream into a freezer-proof container and freeze for 2 hours. Original recipe and segment for WGN Chicago. To watch the broadcast, click here! Whenever I really want to make a great culinary impression on someone, I bring them my homemade chocolate truffles! While truffles look (and taste) like they take days to make (who has time for that?! ), they actually take under an hour to create, and use the simplest of ingredients. The real difference in taste and texture is made with very good quality ingredients, especially the chocolate. There are endless flavor combinations for truffles, but one of my favorites are White Chocolate Truffles with Candied Pecans. The white chocolate has such a delicate vanilla flavor on its own and is enhanced with Butterscotch Schnapps—a light booziness that rolls around on your tongue with a rich delight. The crunch of chopped candied pecans is what makes this particular truffle even more flavorful and delicious! The creamy white chocolate ganache with the sweet crunch of the chopped nuts is a perfect flavor and texture combination. Very rarely does it get any better—or any easier—than this! Don’t take my word for it, make them and taste for yourself! Place a heat-proof bowl over barely simmering water. Add the heavy cream and chopped chocolate and stir with a wooden spoon until completely smooth. Remove from the heat and add the salt, vanilla, and Schnapps. Stir until completely incorporated. Cover with plastic wrap and refrigerate for 1 hour, or until firm. Scoop rounded Tablespoon-sized portions of chocolate and place each one onto the lined baking sheet. Gently roll each one into a ball and immediately roll through the chopped candied pecans. Place in the refrigerator to set. Serve at room temperature. During the winter, I love to have a pot simmering on the stove filled with quintessential seasonal aromatics that make my home smell welcoming and festive. Just before Christmas, I had the pleasure of showcasing some last-minute decor ideas on WGN News and this (along with a few others!) was a hit in the newsroom! My Simmering Winter Potpourri does just the trick! Things like cinnamon, orange, rosemary, and even Balsam branches gently release their fragrance in spiced apple cider and fill the air with the most wonderful scent. The best part is all you need to do is add more apple cider or water as needed and your home will smell like a wintery wonderland! Happy Holidays - from me to you! A very festive and fabulous Christmas Eve morning at WGN Chicago! Click here to watch the broadcast to discover my other 5 simple and last-minute decorating ideas. Add all of the components to a saucepan and bring to just under the boil. Then, reduce the heat to simmer. Allow the aromatics to simmer throughout the day or evening, adding more water and apple cider as necessary. Deck Your Home with All Things Jolly! During the holidays, time can play a huge roll when it comes to finishing the little details. Use the ideas I’ve created here to help set the mood for a festive soirée and still have time to bake those 21 dozen decorated cookies you planned on giving out to your friends and colleagues this year (remember that idea you got after a bottle of wine and endless hours on Pinterest?!). I believe that each and every day should be festive, stylish, and simple. When I am coming up with holiday décor ideas I try to use easily-found components, concepts that do not take hours to complete, materials that are budget friendly, and most importantly ideas that won’t take an entire weekend to finish. This year, I wanted to add a bit of holiday cheer to everyday items commonly found around the house, your local grocery store, and maybe a quick trip to a craft store (don’t worry, I promise no glitter!). And since I live in a mid-rise, I also wanted to highlight holiday ideas that don’t require “storage” after—making them perfect for a smaller space to add a festive touch! This is my favorite time of year, and I want to take as much time as I can celebrating and entertaining my friends, family, and clients—with my simple ideas here you will be able to join the party and deck your home with all things jolly! This crystal bowl filled with mini LED battery-operated lights and silver tinsel is a must for part of your holiday décor this year! The effect of the sparkling crystal against the shiny tinsel, all illuminated with tiny lights adds a “WOW!” factor to any table, sideboard, or entry. The same concept can be done in any clear vessel—so use your imagination! Imagine multiples of these down the center of your dining table for a dinner party – I’ll bring the champagne! A simple white cotton napkin gets a festive and glamorous makeover with the addition of tartan plaid ribbon, tied in a big bow, then adorned with a sprig of fresh rosemary and crystal chandelier prisms (which I found on Amazon.com). At the end of your dinner party (or buffet), encourage guests to take the crystals home to adorn their tree—an instant take-away bobble—and enjoy for years to come! Plain glass hurricanes and unscented white pillar candles turn into a winter wonderland with peppermint candies and regular coarse Kosher salt—all available at your local grocery store! Fill the bottom ¼ full of peppermints then pour spoonfuls of coarse salt over the candies. Not only does the salt take on a snow-like effect, it also helps to stabilizes the candle base. Place these all over your home to instantly add a bit of holiday cheer to any room or table. A silver tray filled with holiday cards set either atop a coffee table or under your Christmas tree is probably the chicest way to both display and contain all of those “fa la la” greetings! If you don’t have a silver tray (I find mine at flea markets and thrift stores) a decorative bowl or even a large platter will work just fine. Transform everyday stemmed glassware with the addition of tiny red velvet bows to add instant holiday cheer! These charming little bows already come with a twist-tie closure, making the application just a few twists away (martini, anyone?)! Best of all, after your soirée, you can either save the bows for next year or use them to decorate packages! Easily found at your local grocery store, cinnamon sticks tied in little bundles with velvet ribbon are the perfect addition to the doorknob of a powder room, as package ties, around a wine bottle for a host/ess gift, or even hung throughout your Christmas tree to add a spicy scent (especially if you have a faux tree). A little spice, and everything nice!